UWM is a good value and an even better investment because we’re competitively priced and students qualify for special discount programs that bring your costs close to Wisconsin resident rates—and far below the price tags of private colleges. Milwaukee is one of the best-kept secrets in the Midwest, a vibrant city of unique neighborhoods on the shores of beautiful Lake Michigan, just 90 minutes north of Chicago. We think there’s something especially exciting about UWM with all the opportunities of city life fueling your work and play. It’s easy to build an eye-catching resume through internships and networking opportunities with major employers based right in our backyard. And when your college-to-career path needs to take a detour for down time, there’s no place like our hometown. Life at UWM is a melting pot of ideas, cultures and perspectives. It’s thinking about what our 26,000+ UWM students need to succeed 24/7. Student services from course tutors and academic advisors, to fitness and health resources – we’ve got your needs in mind. We’ve also got nightlife, weekend programming and those in-between class times covered too. Our residence halls are more than a place to sleep and brush your teeth. 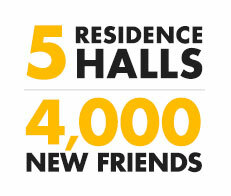 They’re the hub of student life, a place where lifelong friendships are formed and memories are made. If your vision of a residence hall is door after door of tiny rooms sharing a single bathroom—standard at many other schools—be prepared to be pleasantly surprised. Our suite-style accommodations are set up more like apartments, where you’ll live with three to five other students. The best way to experience UWM and all our hometown offers is to plan a visit, and we promise that it’s worth the trip. We offer student-led tours six days a week and other special visit programs throughout the year. Can’t make it in person? Look for UWM at some national college fairs too, including in Minneapolis, Chicago, and Milwaukee. Illinois students are eligible to receive an additional $1,000 award each year through the Milwaukee Advantage Program (MAP). The MAP award is renewable. MAP will be offered at both Fall/Spring terms – Spring term admits will be eligible for $500. Must be enrolled full-time in order to be eligible. Falling below full-time status will result in cancellation of award. Must be an undergraduate student and maintain good academic standing. Through programs such as the Midwest Student Exchange Program (MSEP), students coming to Wisconsin from eligible areas and meeting program criteria are able to attend UWM at prices they can afford. The Midwest Student Exchange Program (MSEP) is a multi-state tuition reciprocity program that makes attending out-of-state colleges and universities more affordable for non-resident students. Through the MSEP, participating public institutions agree to charge students no more than 150% of the in-state resident tuition rate for specific programs; private institutions offer a 10% reduction on their tuition rates. Must be admitted as a degree-seeking new freshman or degree-seeking new undergraduate transfer student. This includes degree-seeking undergraduate students admitted to online programs. Must enroll and remain enrolled in an academic program (full time and part time students are eligible). Second degree students, re-entry applicants, non-degree students, Flex degree students, and students admitted to a certificate program are not eligible. How do I apply for the MSEP tuition discount? Students are automatically reviewed for eligibility for the Midwest Student Exchange Program tuition at the time of review for admission, so no additional application is needed. Students from participating MSEP states outside of WI will automatically be eligible for MSEP tuition provided they meet the criteria as stated above. Students will be notified via letter of their MSEP status, once they have been admitted to the University. The Minnesota–Wisconsin Tuition Reciprocity agreement allows residents of Minnesota attending Wisconsin institutions receive a special rate. If you wish to take advantage of the Minnesota-Wisconsin Tuition Reciprocity Agreement, apply for certification as a Minnesota resident. Please note, Minnesota residents may not apply for the MSEP Program. For information about MSEP, Minnesota Reciprocity or any other out-of-state questions, please contact the admissions representative from your state, listed below.